Alec sought my advice about his lower eyelid bags. These can be variable from just prominence of the lower orbital fat, to crepy lower lid skin to what are called “festoons” or bags. 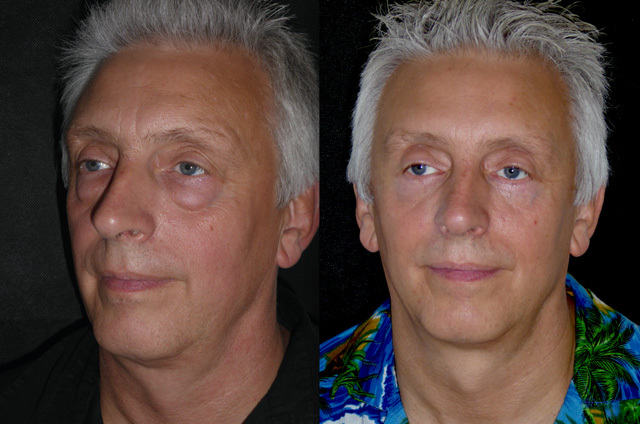 Alec had significant lower orbital fat prominence and lower lid skin excess just short of Festoons. 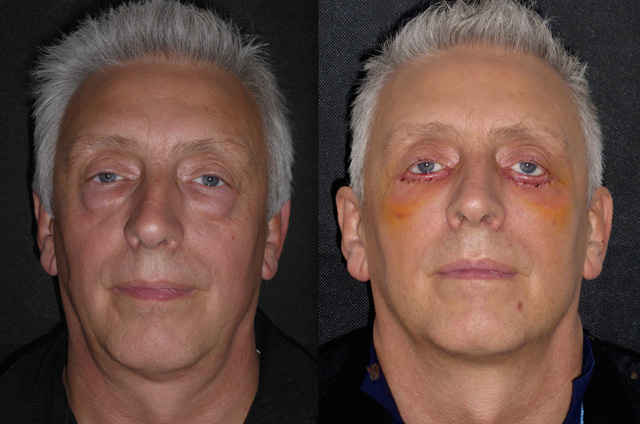 We undertook a tranconjunctival lower lid blepharoplasty with fat reduction, superficial skin pinch and lower eyelid CO2 laser to assist with skin contraction, under local anaesthetic. 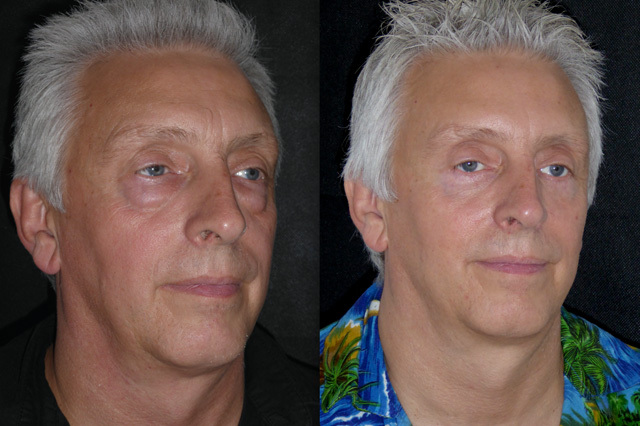 The initial scary appearance is completely normal with lower eyelid surgery. Swelling within the tissue makes the lower lid tissue heavy and gives this characteristic Ectropion appearance. This will correct in a few days when Alec’s lower lid stitches are removed. 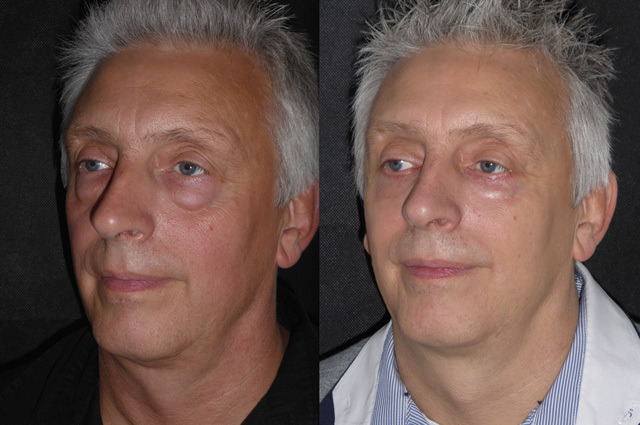 I approach the lower eyelid using a bilamellar approach. 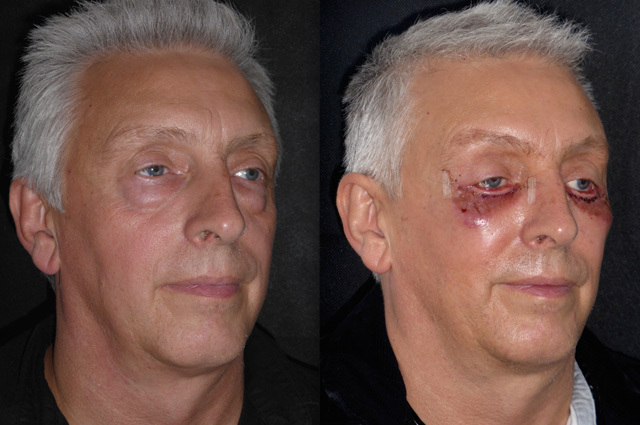 This means that the fat is addressed from behind the lower eyelid with no visible incision and only if skin needs to be removed do I make a very shallow incision (just through skin) under the eyelid. 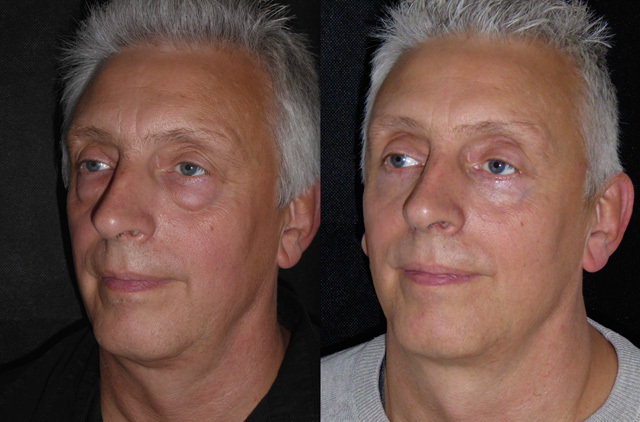 This approach is more technically demanding that traditional under eyelid incision (subciliary) surgery but it does leave the important supportive layers of the lower eyelid intact reducing the risk of later eyelid rounding or eye shape change. 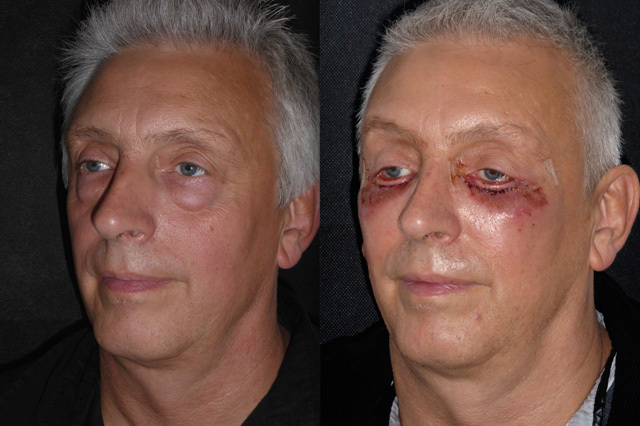 Day 5 and Alec is back for removal of the lower eyelid skin pinch stitch. Much of the swelling has improved and his eyes are returning to their normal appearance but will take another week or so. 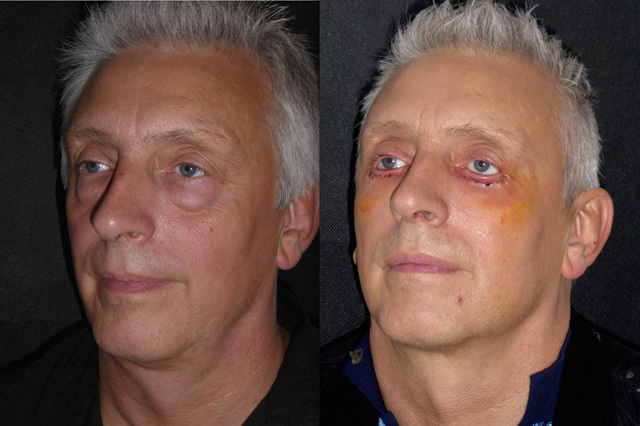 The CO2 laser has crusted and descabbed leaving fresher contracted lower eyelid skin with a nice contour - no more bags! 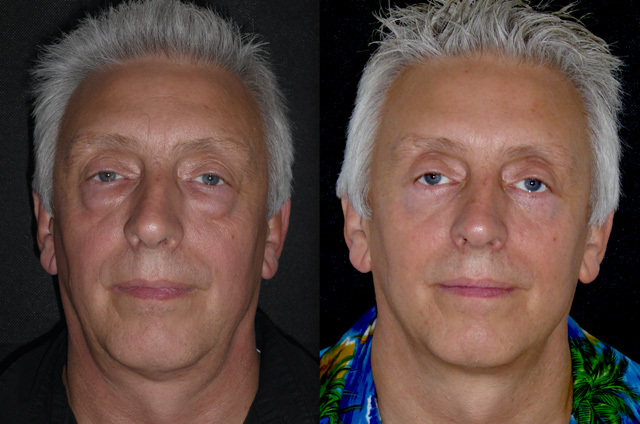 Alec is back for review 4 weeks after his local anaesthetic transconjunctival lower lid blepharoplasty with skin pinch excision and CO2 laser and looks great. 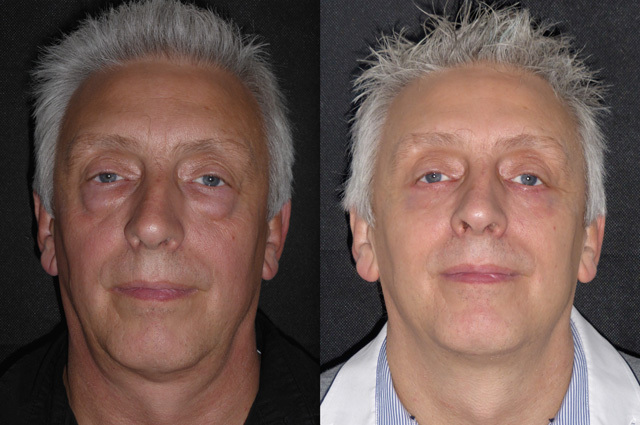 Those bags have gone and his eyes look fresher and rejuvenated. I apologise for the change in camera setting here - I don’t know how that happened, I am usually meticulous about photography position, lighting and settings (as my patients will attest!) but these photos are over exposed. I would rather put them up as taken than digitally alter them at all. 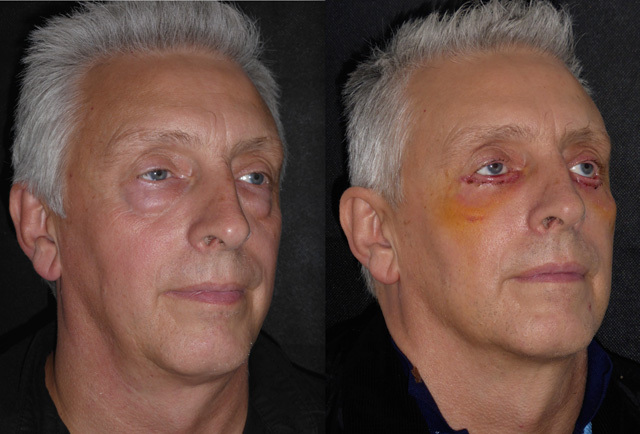 Both pre and post op photos are with a flash as can be seen in Alec’s pupil. A pet annoyance of mine visible in most glossy brochures is before and after photography “assisted” with different lighting, position and exposure…. I will do my best to make sure Alec’s 3 month shots are better!! Alec is back for review and I have my camera back on standardised settings. 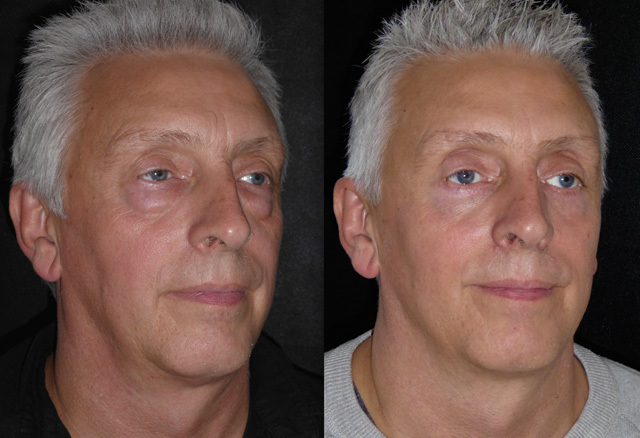 He looks great and is being told by colleagues that he looks much younger! 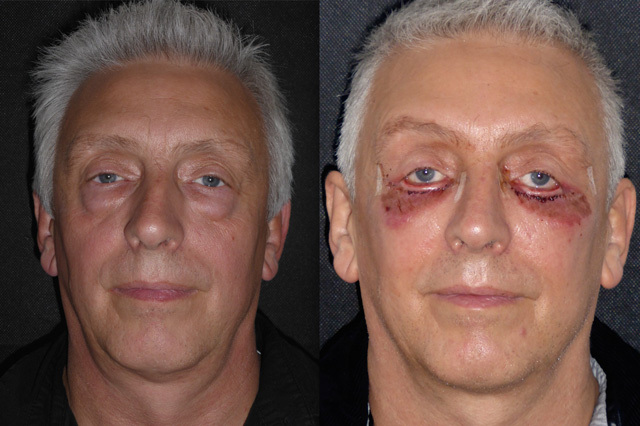 Everything has healed beautifully, his scars are now invisible and the under eyelid skin has contracted and settled nicely. 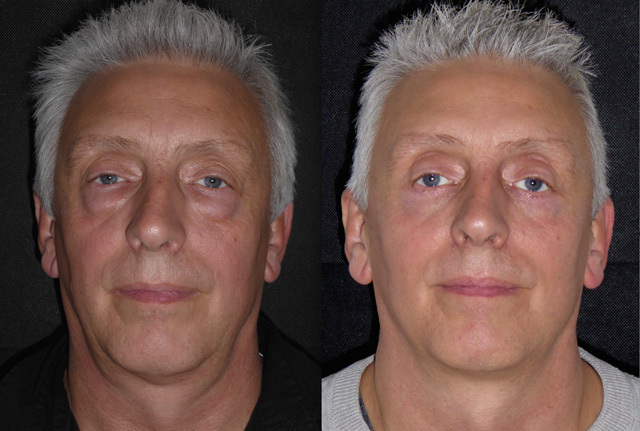 Alec is a great example of how a small procedure can make a huge difference to one’s image. Here is Alec 6 months after surgery. Now completely healed, he looks great. Bags gone, Hawaiian shirt on and ready for summer! 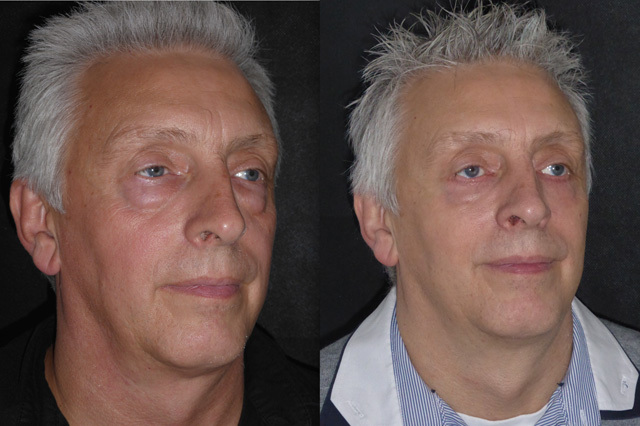 Eyelid surgery does take up to 6 months to completely heal hence these later photos.